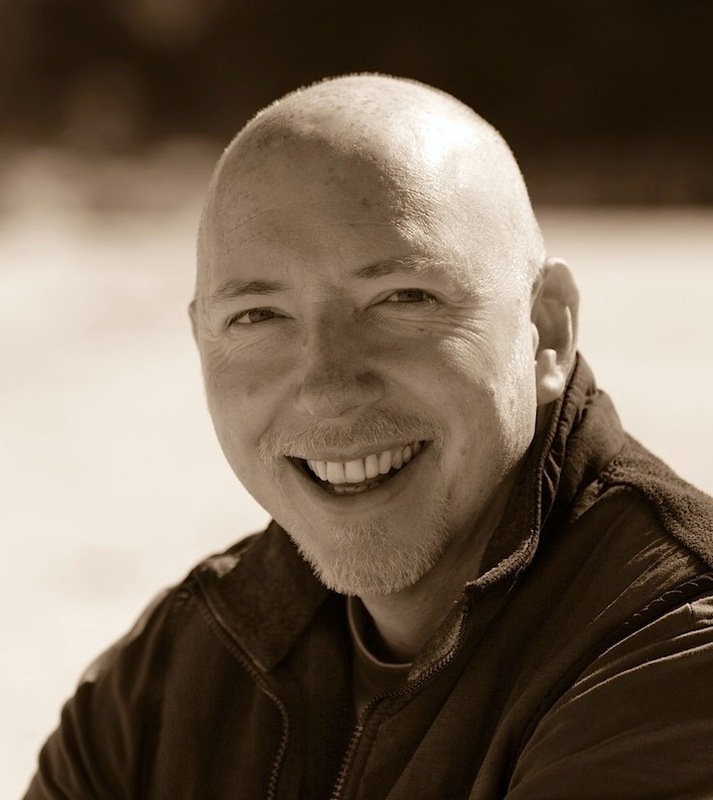 Steve Robinson - Author: It's moving at a pace with Amazon Publishing! It's moving at a pace with Amazon Publishing! I've just looked at my last blog post and realised it's been a few weeks since I last posted. Where did the time go? I'm pleased to say that word count would appear to be the answer. Before I went on holiday I'd written about 45,000 words towards my next Jefferson Tayte genealogical crime mystery. Now, as you can see on the tracker, it's close to 60,000. So, not a bad few weeks. I've reacquainted myself with JT and we're getting along great. I've wondered on several occasions whether he would desert me, given that I've not written any new words for him since I finished The Last Queen of England a year ago. If you're a JT fan, have no fear though. A few weeks into writing JT's narrative and it's just like no time has passed at all - which of course is how it should be with old friends. The story is shaping up nicely and I'm confident that it's all going to work out as planned. I've kept a few threads open as I'd like to see how the characters themselves develop the plot as we go, but everything's in place and I can see it all coming together. That's important for me as a writer, because my stories usually have plenty going on in them and I like to know that it's all going to connect at the end long before I get there - so the nasty surprises are left to my characters and not to the plot. Things are moving along at a pace, too, on the Amazon Publishing front. I've seen the first run of book jacket designs. We're working together with some central ideas that are not far off the existing covers in terms of content: the jetty for In the Blood, the suitcase for To the Grave. So far the cover for the Last Queen of England has excited me the most. I've never felt that the existing cover said 'thriller' enough and that's exactly what it is - and more so than the first two books. This new cover definitely does that. The designer is working on them again now after the first round of feedback and I can't wait to see how they develop. I'm really pleased with the way I'm being involved in the process so far. Equally exciting is that I've just (last Friday evening) received the edits back for In the Blood. Yipes, what a lot of red ink! I was hoping this part of the process wouldn't distract me too much from getting on and writing the next book, but it's clear that it will. I was working on it all day yesterday (Saturday) and I'm still only on page 25! But it's all for the betterment of the book, and I have to shout out a little wow! to my copyeditor, who has done a great job with it. I thought it was in pretty good shape, but it's about to get a whole lot better. I'd planned to write in the mornings and edit in the afternoons until it was finished, but then I thought that might be too distracting. 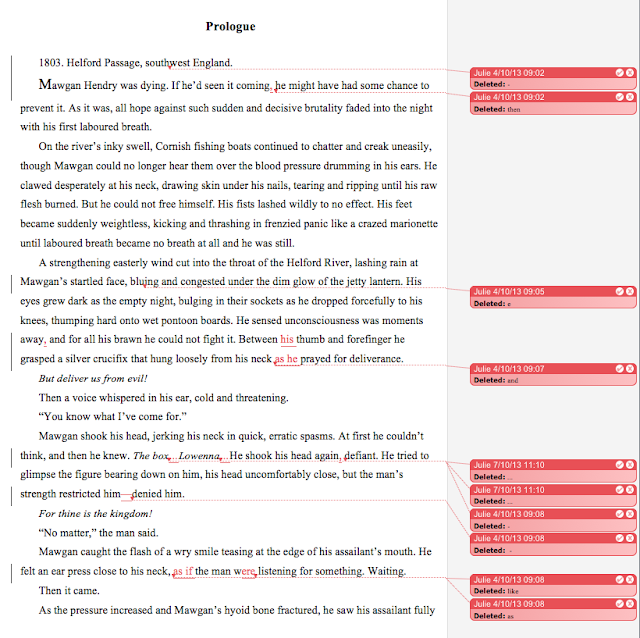 I like to get into my characters' head's and stay there as much as I can, so I've decided to finish the edits for In the Blood and then get back to the writing. The word count won't go up as fast as I'd like, but when it does I'm sure the content will be better for it. I'm hoping that books two and three don't require as much editing, but we'll see. Hopefully I'll get a full week in which to write in between editing each book. Although at the pace things are moving, I might well be editing solid for the next few weeks. But that's not a bad thing in itself. While I was editing yesterday I thought that it was good to refresh myself with everything that's happened in the earlier books as I write the next. I'd love to be able to share some of the new cover designs with you, and I'm sure I will at some stage, but I don't think I'd be allowed too just yet, and they are only in the early stages of development. I'll ask if I can show them, and maybe later I'll show the transition from ideas to finished covers. I can see why it's taking you a lot of time to work through the edits. I hope you feel able to retain your own version where you prefer it? Hard work, but exciting. Really good that you are involved with the covers - how different from trad pub. Yes, I suppose it would be good to be able to compare from experience. I've heard Amazon Publishing are very different and treat their authors like customers rather than products. Kind of makes me glad I didn't get picked up early in my writing career, when I most likely would have grabbed at any publishing offer that came along. Interesting to see the copy editors changes. 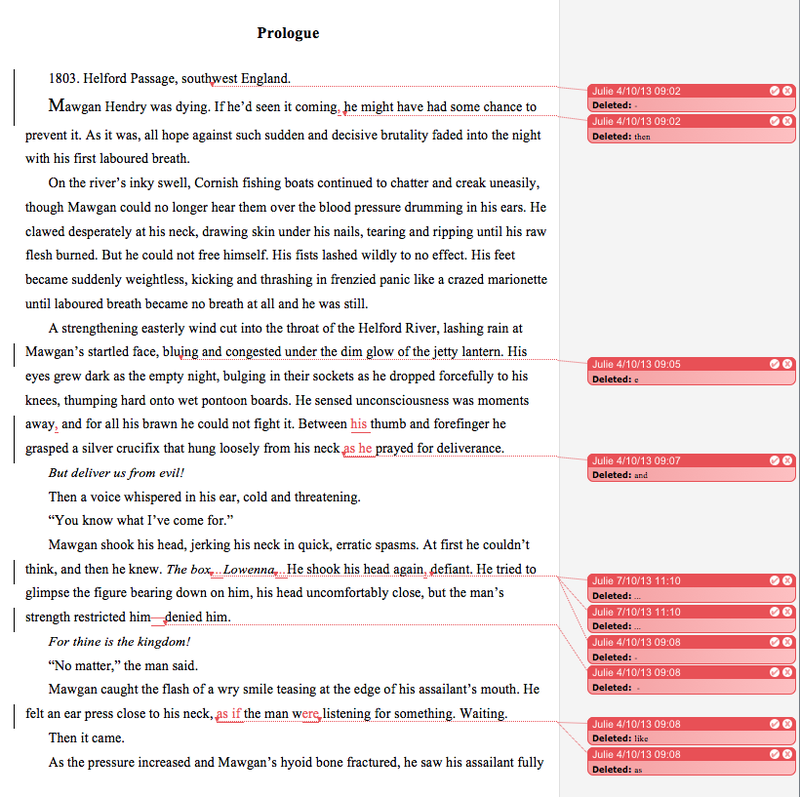 One useful aspect of going over the editing before continuing with book 4 is that you will be able to incorporate some of the editing style changes into book 4 from the first draft. Absolutely George, I'm definitely learning a lot from all this and book four should need far less work, although having said that there will probably be more work to do in other areas. All part of the process, whichever way you look at it, of course.